The Twin-flowered Agave grows very symmetrical, in a 3′ by 3′ rosette shape. The leaves are dark green in color and are smaller than most Agaves at 1/4″ wide. Unlike most Agaves the leaves on this one are unarmed, so it can be planted where there is a little pedestrian traffic. Twin-flowered Agave can be grow in full sun or shade. When in full sun the leaves will be stiff, when in shade the leaves will be a bit more relaxed. 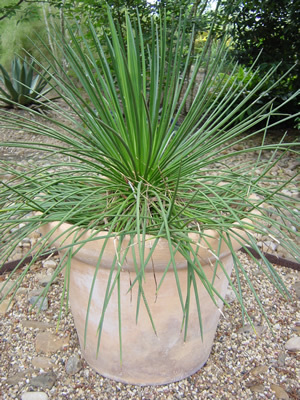 Like most desert plants this Agave prefers a well drained soil and can survive with little water. The life span of Agave geminiflora is generally 10 years, after this the plant sends up a large spike flower that can be up to 18 feet tall. Agave geminiflora will experience some frost damage at 25°F, in colder climates it is best to plant in containers that can be moved to protected areas in the winter.